Trailed and mounted examples from Great Plains’ new X-Press short disc harrows range will be making their UK public debut appearance on the company’s stand (R31) at LAMMA alongside selected machines from the manufacturer’s tillage, planting and seeding ranges including the manufacturer’s latest direct drill offering, the SpartanII 607. Great Plains claim the new X-Press is more versatile than ever with increased options in specification providing solutions for a wide range of tillage tasks from shallow cultivations as part of a cultural grass weed control strategy, to stubble cultivation incorporating residue, cultivation and levelling of ploughed or vegetable ground. Built around an all-new chassis utilising tubular steel to the wing sections, new options include a levelling board, side deflectors and hydraulic control of disc gang angle adjustment from the tractor cab. Depth control settings have been upgraded and refined by the use of colour coded spring clip spacers and the choice of cultivation discs has been expanded. 515mm diameter Turbo Coulter blades for minimal disturbance applications are now available as well as conventional notched cultivation discs and SoilRazor discs, which are designed for chopping and sizing tougher crop residues such as cover crops and maize. Both SoilRazor and notched discs are available in 508mm or 560mm diameters allowing for a progressive cultivation option varying front to rear. The new mounted X-Press models are available in 3.0, 3.5 and 4.0 metre working widths. The 3-metre mounted model to be displayed at LAMMA will be fitted with an ST toolbar which has also been updated and now features a headstock design that has been modified to suit modern tractor linkage dimensions. The new trailed X-Press units come in widths of 5.0, 6.0 and 7.0 metres. Depending on specification and working width, the power requirement for mounted units ranges from around 70hp to 180hp and from 140hp to 480hp across the trailed model range. Great Plains will also be showcasing its latest direct drill offering, the new 6-metre SpartanII 607. Equipped for grain and fertiliser or grain only use and folding down to 3-metres for transport, it features a new, patented seed tower configuration with half the number of towers as its predecessor. Towers now incorporate tramlines with auto rate adjust, integrated blockage sensors and an individual row shut-off option. Other improvements include a variable rate hydraulic drive – which replaces the previous mechanical system, operator-friendly seed calibration from the rear of the machine, improved on-road handling and relocated, easier-to-access weight packages. Providing up to 250kg pressure per row in order to penetrate in no-till establishment systems, the weight packages can now be quickly and easily removed for min-till operations or to reduce compaction. 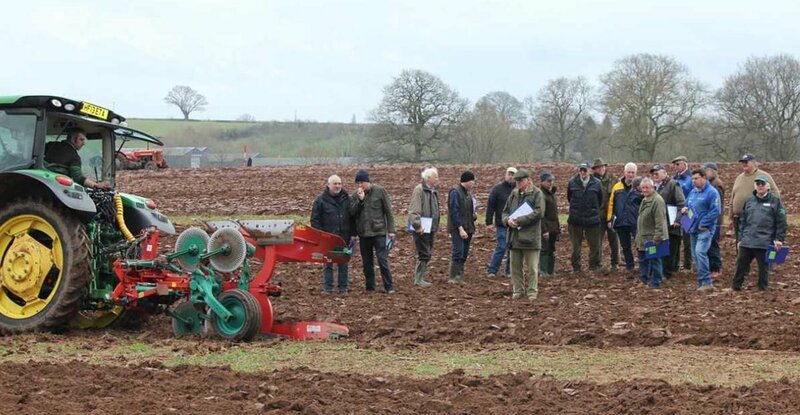 Other products to be exhibited at LAMMA include the recently launched 4-metre Saxon minimal disturbance and Centurion cultivator drills, YPE Planter, SLD 460 one-pass cultivator, 4.6 metre CultiPress and a DTX 300.